Myth, legend, fable, fairy tale -- where are they similar and where do they diverge? Kristina Wojtaszek, author of OPAL, is kind of the Fairy Tale equivalent to my Mythology love, over at World Weaver Press, and we thought it would be fun, and productive, to get together and talk about our two, very related fields. So of course we started at the beginning! Amalia: I'd like to ask, do you think fairy tales/fables and myths serve kind of the same role in society? Where do they diverge? or don't they? Kristina: Myths, to my mind, are set in specific cultures, even specific locations (whether real or imagined), and the characters that inhabit them are all named specifically and accomplish specific tasks. Fairy tales come from the foggy lands of glass mountains and dark woods that have no specific place on a map, or even a name usually. They occur at figurative places in time, not imbedded in any certain culture or era, and even their characters are often unnamed. "Long ago there was an old woman..." The Greek Homer who traveled to such and such islands in the year blah (you're going to have to help me out with the details here! Maybe that's why I do better in the fluffy, abstract world of fairy tales-- there are no dates, locations or even many names to remember. [...]) That's why I get easily hooked on fairy tales; they're timeless. Yeah, I know, spindles and glass slippers may not be all the rage in the 21st century, but falling in love, death (or eternal sleep), a woman's suppression in marriage, a mother's love and devotion, and all things magical... life after death, bravery, speaking bones that betray truth. Oh, the possibilities of retelling those old tales are just endless! I could totally see someone writing a modern murder mystery based on the old Grimm's The Singing Bone, for example. Now myth and legend-- those babies are what made society, what bound a specific grouping of people together in a certain locale. Those are the stories of how the world came to be, the embryos of culture. They are far from nebulous, born like pearls around some tiny grain of truth, and worked over and shined through the centuries. They have names, faces, places and dates. They are hidden beneath thumb tacks on a map, in someone's head anyway. And they serve to make the norms of a culture more alive and valued. Vikings, for example-- I can't imagine a viking myth that didn't involve some aspect of fighting. That was the life they were born and bred to, and it's only natural their tall tales should be armored with the same weapons of war. Fables, as I've always understood, are lessons, or tips, serving guidance in short, quick-witted tales that make one nod. Fairy tales also serve as lessons (hey little girl, don't go wandering in the woods all alone, there are wolves and uncivilized men out there...) but fables are more about preserving idioms to ward against idiots! If you beat your donkey, one day he's going to kick back. Don't flash your valuables in the face of others, like the tree who retains its pretty leaves all year, or you might get hit with a heavy snow storm that breaks your branches, while the naked trees survive just fine, and then how will you feel? Things like that. They are like the older versions of our mild sayings today, like "a watched pot never boils," only so much more creative and visual, with a bit more story to flesh them out. Amalia: What you're saying about fables is really interesting, especially so close to what you're talking about with the Norse myths -- in the Havamal (from the Poetic or Elder Edda), there is a very, very long tract of common-sense words-of-wisdom from Odin that sound very fable-esque by your definition. I've talked about them a bit on my blog here and another grouping appears in the Saga of the Volsungs, spoken by Brynhild, giving advice to Sigurd, which I talk a little bit about here (and more on Brynhild and some of her wisdom in the first part of this post). Odin lands on the "A fool and his money are soon parted" side of the spectrum, for sure -- those little one liners that stick in your head. In this sense, I think the Edda is serving the role of both established text of mythology, and also that of the Fable, by your definition. But then again, the more I read of the sagas, the more I think they also serve a kind of fairy-tale role -- and where the sagas themselves fall, under myth, legend, or fairy tale, is something I think is up for debate. I think that mythology serves a dual purpose though -- especially among the Greeks -- of cautionary tales. Over and over again you see this repetition of a mortal becoming too proud, and then being punished for his or her hubris. There's the story of Arachne, who boasts about her weaving, offends Athena and is turned into a spider. We see it also with Tantalus, who thinks himself so above his place that he dares to trick the gods by serving his own son for dinner, and when the gods see through it, he's punished by being put into a pool of water that recedes when he tries to drink, and surrounded by trees, the fruit and branches of which are always just out of reach. Narcissus who is so proud of his beauty, who because of Nemesis falls in love with his own reflection. Maybe the examples are more concrete in person and place and setting, but I think in part that's due to preservation of the source material more than anything else. You also see "punishments" for deviant women. Europa wandering off and being whisked away by the bull, Ariadne betrays her family to help Theseus and winds up abandoned by him on an island to die. The Amazon queens who are constantly being raped and carried off by heroes (and those names get awfully confused awfully fast). Where do you feel Opal falls? Is it a story you can see having been told at the hearth by the old grandmother as a warning or just for sheer entertainment or to explain how something came to be? 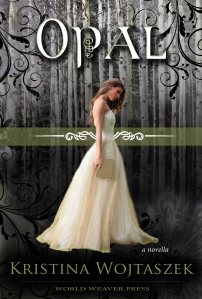 Kristina: Although Opal is a retelling of Snow White, a well known fairy tale, I fleshed the story out so that it takes place in a specific world of men and Fae with very specific characters. So what's interesting is that the story of Opal actually becomes myth in the sequel I am working on! In Obsidian, the events of Opal are now history, and those events and characters have lost quite a few details over the years, details that have been artfully replaced. So, in Obsidian, Opal is a form of mythology where the men and Fae of long ago have been turned into gods and goddesses that are worshiped by a changed population. And yet, Obsidian will also be a fairy tale retelling (not of Snow White again, but of another classic tale that I will let the readers figure out on their own). What I've played around with is the idea that there is a grain of truth in every "lie," or story. And this, I think, is true for fables, folklore, fairy tales and mythology alike. Whether you prefer fairy tales or mythology, fables or legends, Opal just might be the book you're looking for! Trapped in a Fae-made spell, Androw waits for the one who can free him. A boy raised to be king, he sought refuge from his abusive father in the Fae tales his mother spun. When it was too much to bear, he ran away, dragging his anger and guilt with him, pursuing shadowy trails deep within the Dark Woods of the Fae, seeking the truth in tales, and salvation in the eyes of a snowy hare. But many years have passed since the snowy hare turned to woman and the woman winged away on the winds of a winter storm leaving Androw prisoner behind walls of his own making — a prison that will hold him forever unless the daughter of an owl can save him.